The Congregation Archives is the repository for the records of the Congregation of St Joseph and for the archives of its seven (7) Founding Congregations: the Sisters of St Joseph of Cleveland, OH; of La Grange Park, IL: of Nazareth, MI; of Tipton, IN; of Wheeling, WV; of Wichita, KS; and of the Medaille Province (Crookston, MN, Cincinnati, OH, and Baton Rouge & New Orleans, LA). The Congregation Archives document the charism and ministries of the Sisters from their arrival in the United States from France in the 1850s, to the present time. 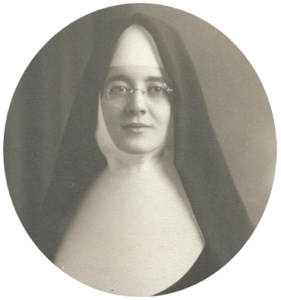 Drawing upon their 200-year old tradition of serving “the dear neighbor,” the Sisters of St Joseph quickly became involved in education and healthcare, assisting in and establishing schools, hospitals, orphanages wherever they were needed. Types of materials in the archives include historical manuscripts & correspondence, administrative records, financial ledgers, photographs, audio & video recordings, scrapbooks, architectural drawings, artifacts, books, dissertations, & newsletters. The Archives staff welcomes historical inquiries by email, by mail, or by telephone.